The West Virginia Democrat met separately earlier this week (in HIS office) with new Energy Secretary Steven “Coal is my worst nightmare” Chu and with new EPA adminstrator Lisa Jackson. Byrd appeared to be signaling that Obama should rethink any plans to bypass Congress and have EPA try to set binding limits on carbon dioxide emissions through new regulations. In his meeting with Secretary of Energy Chu, Byrd told the Secretary that he wanted to “feel comfortable” that the Secretary recognized the importance of coal to our energy future, noting that “coal supplies half our nation’s electricity needs,” and it is not going anywhere anytime soon. 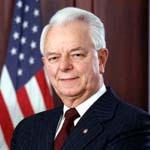 Byrd’s comments were directed to Secretary Chu in light of Chu’s previous statement that coal was his “worst nightmare” and his questioning of the feasibility of clean coal technology. Byrd’s office said that Chu committed to support the $4.6 billion for so-called clean coal technology that was inserted into the economic stimulus package that is currentlymaking its way through Congress. Byrd apparently urged the Obama administration to “proceed with caution” as it works with Congress on climate change legislation. Those who have followed climate change issues for a while will recall that Byrd played a major role in blocking any Senate ratification of the Kyoto Protocol, an international treaty to reduce greenhouse emissions.